"This ceviche is the best you will ever have. It is from Peru and I love making it every time I have friends and family over." Place the potatoes and sweet potatoes in a saucepan and cover with water. Simmer until the potatoes are easily pierced with a fork, then drain, and set aside to cool to room temperature. Place the sliced onion in a bowl of warm water, let stand 10 minutes, then drain and set aside. Meanwhile, place the lime juice, celery, cilantro, and cumin into the bowl of a blender, and puree until smooth. Pour this mixture into a large glass bowl, and stir in the garlic and habanero pepper. Season with salt and pepper, then stir in the diced tilapia and shrimp. Set aside to marinate for an hour, stirring occasionally. The seafood is done once it turns firm and opaque. To serve, peel the potatoes and cut into slices. Stir the onions into the fish mixture. Line serving bowls with lettuce leaves. Spoon the ceviche with its juice into the bowls and garnish with slices of potato. Delicious, refreshing Mexican seafood appetizer that’s bright with flavor. This is the real thing! 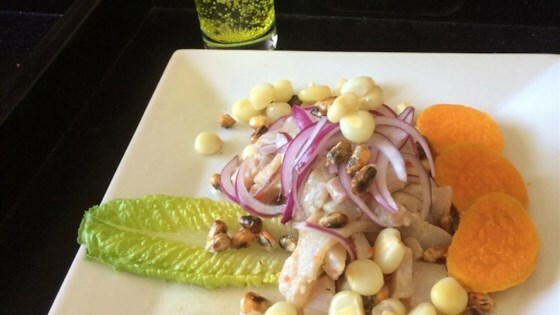 Ceviche is a Peruvian dish and well so far,from all the recipes this one is close to authentic. Le falto el choclo. Hubby love-love-loves this! He is Peruvian, and says this is just like ceviche at home.